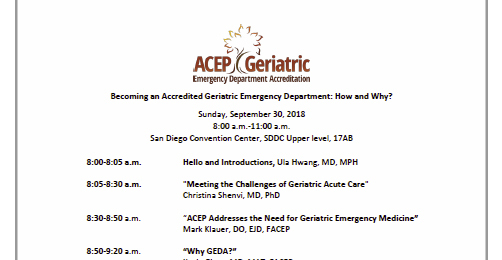 WHEN: September 30, 2018 | 8:00 a.m.-5:30 p.m.
ACEP: Becoming an Accredited Geriatric Emergency Department | 8:00-11:00 a.m. 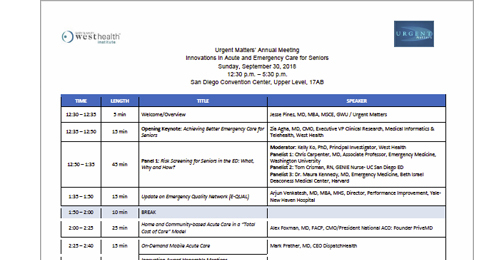 Urgent Matters: Innovations in Acute and Emergency Care for Seniors | 12:30-5:30 p.m. Becoming an Accredited Geriatric Emergency Department: How and Why? "Meeting the Challenges of Geriatric Acute Care"
Panel 1: Risk Screening for Seniors in the ED: What, Why and How?